The San Carlos Institute is a Cuban heritage center founded in 1871 by Cuban exiles who came to Key West to plan the campaign for Cuba's independence from Spain. José Dolores Poyo and Juan María Reyes, two distinguished leaders of Key West's Cuban community, proposed the establishment of an organization dedicated to promoting Cuban cultural values and patriotic ideals. The San Carlos was principally supported by the contributions of the Cuban tobacco workers of Key West who donated a substantial portion of their modest wages to the Institute. 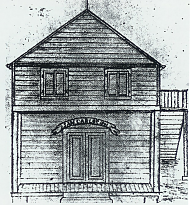 The San Carlos Institute was inaugurated on November 11, 1871 in a small wooden building located on Anne Street near Key West's old city hall. It was named after Cuba's Seminario San Carlos, a place of higher learning renowned for its academic excellence. Father Félix Varela, an accomplished educator, philosopher, and humanitarian taught at the Seminario San Carlos and planted in his students the seed of Cuba's independence and the need for the state to promote humanistic values. Education and preservation of cultural values were the Institute's primary missions. 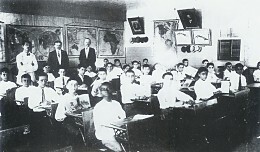 Classes were taught in English and Spanish to children of all races. The San Carlos thus became one of the nation's first bilingual and integrated schools. The San Carlos moved to larger quarters on Fleming Street in 1884. Two years later, the building burned to the ground in the fire of 1886 that destroyed much of Key West. Civic leader Martin Herrera led the effort that rebuilt the San Carlos on a spacious lot, at its present location, fronting Duval Street in the heart of Key West in 1890. Many legendary figures of Cuba's independence movement addressed the exile community at the San Carlos Institute. First among them was José Martí, Cuba's legendary patriot and poet, who so loved the San Carlos that he called it "La Casa Cuba." A very important chapter in Cuba's history took place at the San Carlos Institute. When Martí first arrived in Key West, his first mission was to try to unite the various factions of the exile community. He met with each leader individually and on January 3, 1892 he addressed a massive gathering at the San Carlos and announced that a united front would be established to lead the effort for Cuba's independence. This lead to the establishment of the Partido Revolucionario Cubano that encompassed the ideals and aspirations of a united exile community. The PRC planned and organized the War of Independence that eventually succeeded in ridding Cuba of Spanish colonial rule. Read more about José Martí's visit to Key West. Jubilant exiles gathered at the San Carlos on May 20, 1902 to celebrate Cuba's independence. The Cuban people held the San Carlos as a treasured relic. They were heartbroken when the San Carlos was damaged beyond repair by a hurricane that devastated Key West in 1919. Efforts immediately began to rebuild the San Carlos. San Carlos president José M. Renedo led a delegation to Havana that secured $80,000 from the Republic of Cuba for the reconstruction of the San Carlos. Francisco Centurión, one of Cuba's most prominent architects, designed the present two-story building that incorporates many elements of Cuba's architecture: spacious rooms, high ceilings, graceful curves and arches, marble stairways, louvered windows, hand-crafted mosaics and floors of checkered Cuban tile. The building opened on October 10, 1924. It was a magnificent edifice and referred to by many as "The jewel of Key West." The San Carlos thrived during subsequent years. Its school continued the tradition of academic excellence under the direction of Mrs. Benildes Remond Sánchez, who served as the San Carlos principal for 25 years. Many of its graduates assumed important posts in the private and public sectors. The Cuban government paid the salary of a Spanish-speaking teacher while the State of Florida paid the salary of an English-speaking teacher. Everything changed when a communist dictatorship seized power in Cuba in 1959. The financial assistance provided by the Cuban government ceased, and despite valiant efforts by some civic leaders in Key West, the local community alone was not able to sustain the aging building. Threatened with structural and financial collapse, the school closed its doors in 1973 after the building was condemned for structural deficiencies. The building remained closed for almost two decades. During this period, many of the San Carlos' books and records were lost to the elements or to vagrants who sought shelter in the vacant building. When a portion of the San Carlos' facade collapsed in 1981 injuring a passing tourist, some called for the building's demolition. Other sought to restore the building as a commercial theater. Some Cuban residents of Key West and Miami sought to stop the plans for commercial development of the property, but the courts ruled against them. In 1985, in a last-ditch effort to save the San Carlos as a Cuban historical landmark, they appealed to Florida's Hispanic Commission, a volunteer citizens board headed by Miami attorney Rafael A. Peñalver, Jr. Saving the San Carlos became Peñalver's personal crusade. He led a statewide effort that succeeded in rescinding the plans for the commercial development of the property and saved the San Carlos as a Cuban heritage center. In the years that followed he directed the San Carlos' restoration pro bono and was primarily responsible for raising over $3 million in state and private funds for the project. Jorge and Margarita Khuly were chosen as architects for the restoration project in a national competition. Every effort was made to do as faithful a restoration as possible despite the fact that many of the building's original materials were no longer available. 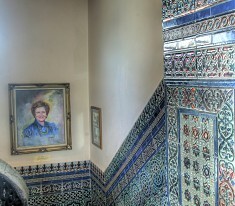 Key West artisans worked for months making handmade replicas of missing wall tiles that surround the Institute's marble staircase. Heriberto Borroto of Miami utilized a special hydraulic process used in Cuba in the early 1900s to reproduce the checkered Cuban tile that covers the building's main floors. In an effort to highlight the building's historic importance, statues and portraits of prominent Cuban historical figures were placed in the building's lobby as part of the renovation. Prominent sculptor Manuel Carbonell chiseled the statue of José Martí from a block of Carrara marble in Italy. Another noted Cuban artist, Gay García, sculptured the bronze statute of Father Félix Varela in his Miami studio. Both statues are considered important works of art. Peñalver succeeded in obtaining the support of Governor Bob Graham and the state legislature in his effort to restore the San Carlos. The restoration was made possible by grants from the State of Florida totaling $2.8 million and thousands of small, private donations. In addition, in-kind services in excess of $1 million supported the effort. Principal sponsors of the Florida legislature's appropriation measures for the project were state representatives Arnhilda Badia, Luis Morse, Javier Souto, Carlos Lacasa, state senators Roberto Casas, Mario Díaz-Balart, Rudy García and Alex Villalobos and speakers Jon Mills and Tom Gustafson. The Department of State's Division of Historical Resources assisted in the restoration process. The San Carlos restoration was truly a labor of love. Restoration funds were used exclusively for construction costs. The Institute's officers and directors donated their time and services to the project and covered all administrative expenses. The law firm of Peñalver & Peñalver PA. administered the project and provided all legal services pro bono. Arturo Espinola, a long-time advocate of Hispanic causes in the Florida Keys, donated his services as a local coordinator of the project. San Carlos treasurer Feliciano Foyo donated all bookkeeping and accounting services. A beautifully restored San Carlos Institute opened on January 4, 1992, exactly one hundred years from the day when José Martí delivered his first address at the Institute. Over 5,000 persons attended the three-day reopening celebration. Duval Street was closed for the occasion and a symphony orchestra in front of the San Carlos played the music of Cuba's great composers. Senator Bob Graham delivered the keynote address from the balcony of the San Carlos. The San Carlos has since served as a shrine to Cuba's heritage and a place of pilgrimage to the Cuban people. The San Carlos also hosts many important cultural, historical, and artistic events throughout the year. Thousands of persons visit the Institute yearly. The San Carlos is maintained by private donations and the work of volunteers. Among them was Bill Collins, a Vietnam veteran who served as building manager from 1992 until his death in 2003. Although not Cuban by birth, he devoted the best years of his life to the San Carlos Institute. Most recently, Alejandro Pascual, a retired business executive, his wife and children have organized the Amigos program and this website to further the Institute's noble mission. The San Carlos Institute is a Florida not for profit organization directed by a volunteer board of directors.